If terms like 'magnetostriction,' mu-metal,' and 'D-ring' arouse your technostimulus receptors, then this quiz on magnetics should be just what you've been waiting for. 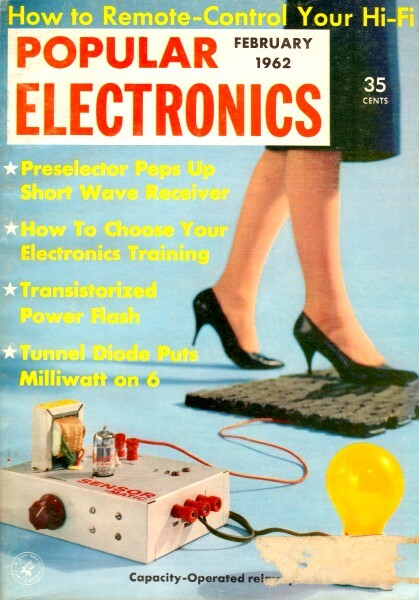 It appeared in a 1962 edition of Popular electronics, but the principles therein have not changed since then. I must admit that I had never given thought to the orientation in which bar magnets should be stored when in close proximity to each other. Neither magnets nor magnetism are mysteries to the experimenter. But this quiz will test your knowledge of the basic principles of magnetic phenomena. Mark each statement "True" or "False" and check your answers at the bottom. 1 - The north pole of a compass points to the earth's north magnetic pole. 2 - If the separation between two unlike magnetic poles is reduced by half, the attraction between them will become four times as great. 3 - If a compass is placed beneath a wire passing electrons from A to B, its north pole will point to the right. 4 - Bar magnets should be stored by placing them so that like poles are side by side. 5 - There is no insulator for magnetic fields. Some metals simply offer more resistance to magnetism than others. 6 - A "D-ring" is usually found on d.c. electromagnetic relay coils. 7 - When a nickel-iron rod is magnetized, it will grow shorter in length. 8 - The electromagnet shown here will have its north pole located at the top of the coil. 9 - An electron passing through the deflection yoke magnetic field and out of the page will be deflected to the right. 10 - A "keeper" is placed across the poles of a horseshoe magnet to prevent the magnet's field from passing through nearby ferrous objects. 1 TRUE. The north pole of a compass points to the earth's north magnetic pole which is actually the south pole of a large magnet inside the earth. 2 TRUE. The force of attraction between unlike magnetic poles varies inversely as the square of the distance between them. 3 TRUE. The north pole of a compass always indicates the direction of the magnetic field in which it lies. To determine the direction of the magnetic field, grasp the wire with your left hand with the thumb in the direction of electron flow, from A to B. Your fingertips will point in the direction of the magnetic field. 4 FALSE. Bar magnets should be stored so that opposite poles lie adjacent to each other. The magnetic field from each bar will then have a closed magnetic circuit lying entirely within the bars themselves. Hence, the magnetic fields are least likely to go into nearby metallic objects. 5 TRUE. There are no materials which resist magnetic fields. However, magnetic shields made of high-permeability materials such as mu-metal are used to bypass magnetic fields around the devices to be isolated from the effects of the magnetic fields. 6 FALSE. The D-ring is a shorted turn of copper used on a.c. relay coils to prevent armature chattering. When the magnetic field set up by the coil starts to collapse on alternate half cycles, a circulating current in the D-ring builds up a magnetic field which holds the contacts closed. 7 TRUE. This is the principle of "magnetostriction" used in ultrasonic transducers for sonar and in ultrasonic cleaning devices. 8 TRUE. Electrons will enter the coil from the bottom and exit at the top of the coil. Grasp the coil with your left hand with the fingers wrapped in the direction of the electron flow. Your thumb will point to the north pole. 9 FALSE. Use your left hand to determine the magnetic field around a moving electron. The thumb points in the direction of electron flow and the curled fingers point in the direction of its magnetic field. Hence, the electron coming out of the page will have a clockwise field around it. The magnetic field to the right of the electron will have the same direction as the field of the deflection coil. Since magnetic lines which have the same direction repel each other, the electron experiences a force to the left. 10 TRUE. Almost all of the magnet's magnetic lines of force will pass through the soft iron bar. The "keeper" is usually employed when storing permanent magnets in order to preserve the magnetic strength.